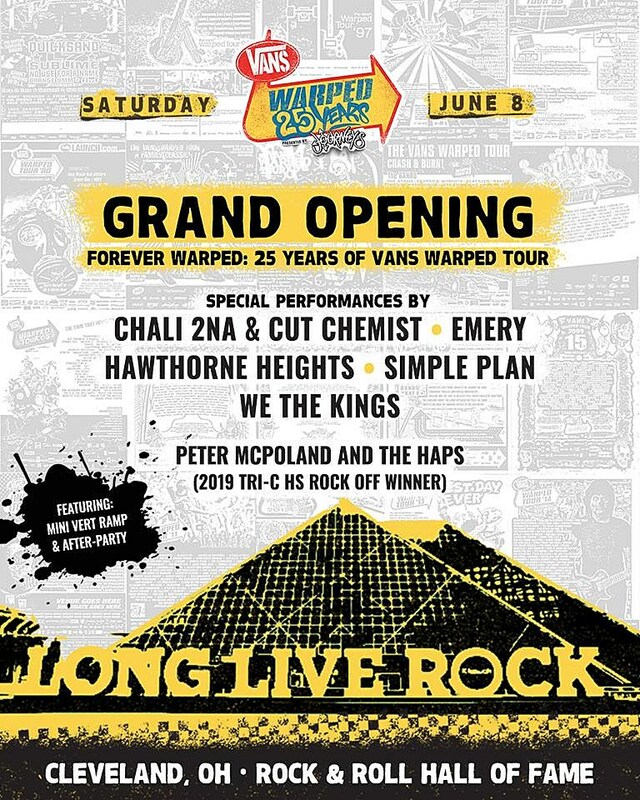 The lineups for the three Warped Tour 25th anniversary festivals (in California, Cleveland, and Atlantic City) are out now and they’re… not bad! Definitely more “classic” Warped Tour than the lineup for last year’s “final” edition as a touring festival was. 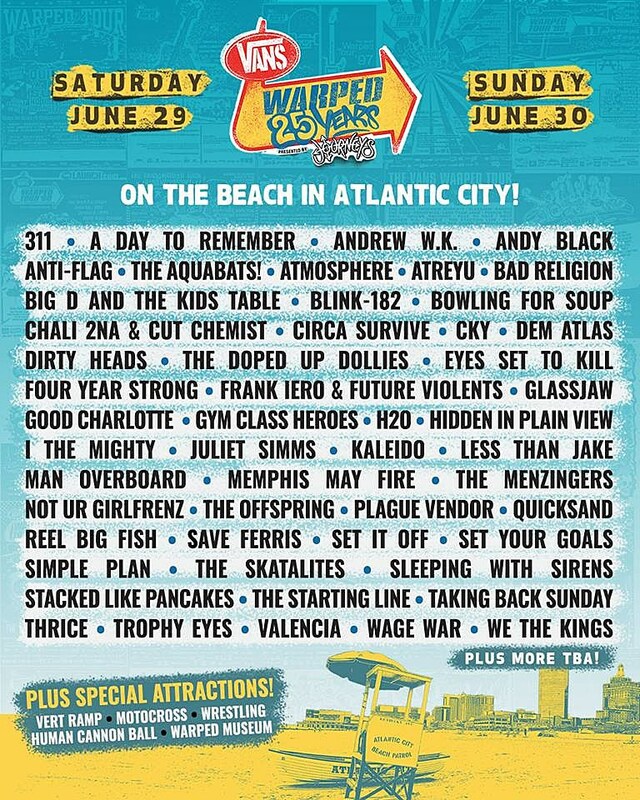 The Atlantic City fest, which goes down June 29 & 30, has blink-182, Bad Religion, The Offspring, Quicksand (who played the very first Warped Tour in 1995), Glassjaw, H2O, The Menzingers, Anti-Flag, Andrew WK, The Starting Line, Taking Back Sunday, Thrice, The Aquabats, Atmosphere, Circa Survive, Frank Iero, Less Than Jake, Reel Big Fish, Save Ferris, Chali 2na & Cut Chemist, and more. The Mountain View, CA fest, which goes down July 20 & 21, has Jawbreaker (! 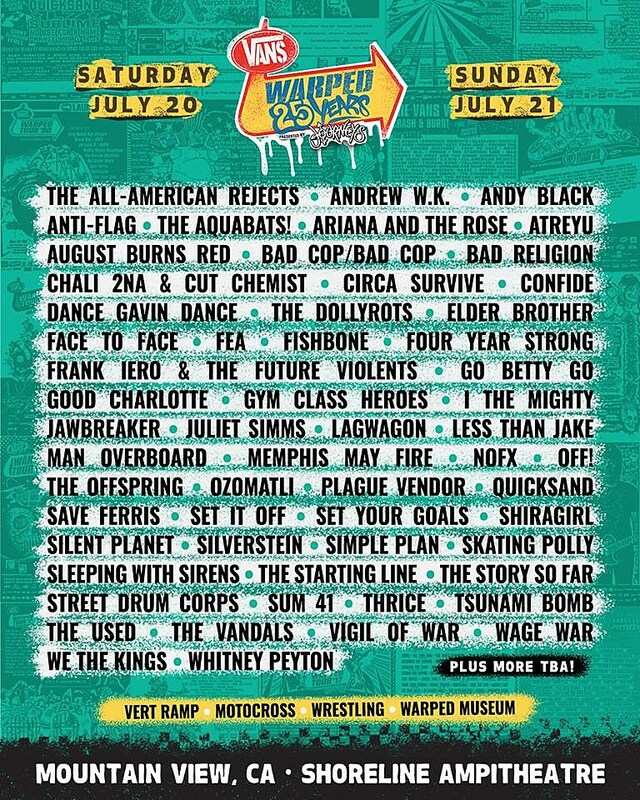 ), plus Face to Face (who played the first Warped Tour), Fishbone, Lagwagon, NOFX, Sum 41, The Vandals, and more, and like Atlantic City it also has Bad Religion, The Offspring, Less Than Jake, Quicksand, Andrew WK, Anti-Flag, The Aquabats, Circa Survive, Frank Iero, Plague Vendor, Save Ferris, The Starting Line, Thrice, and Chali 2na & Cut Chemist. The Cleveland fest is smaller — it’s just one day (June 8) and has just a few acts, the most exciting of which is Chali 2na & Cut Chemist.